Molly blinked as she opened her eyes; then looked at the clock on her bedside table. It was 8 O’clock! She jumped out of bed quickly and stumbled into the bathroom to wash her face. She’d completely forgotten her appointment with Wilf at 9 O’clock. She smiled as she thought of the first time she met him. He was introduced as Wilfred and was quite angry. He hated his name as he thought it sounded old fashioned. “You can call me Wilf,” he’d said shyly. How would she be able to have a shower, dress and then eat breakfast before keeping this appointment? Molly loved her food and was tempted to get dressed and eat missing out on her daily shower. Then Molly smiled. Maybe she wouldn’t smell good if she missed her shower and she thought of Wilf sniffing in disgust whenever Stinky John came to visit. He was tall and muscular and was always working out at the gym and sweated a lot. She wouldn’t want to smell like that! She’d laughed and called him Stinky when they first met at the gym and he laughed and said, “That’s a good name, I like it!” He was a good natured person. She jumped into the shower and rubbed soap into a lather placing it all over her body. She paused to watch the soap foam make a little river into the drain outlet in the shower and then danced around to make sure all soap was washed away. Dressing quickly she ran to the kitchen and poured a big helping of cereal and milk into a bowl gulping it down quickly. Then after quickly cleaning her teeth she ran to the garage and climbed onto her motorcycle. She was going to make it on time to meet Wilf, but still felt a little hungry. Arriving at the street where Wilf lived she noticed him standing by his mail box looking anxiously down the street. Wilf smiled as his friend skidded to a stop on her motor cycle in front of the house. “I thought you’d forgotten our appointment Molly he said. Molly didn’t want to tell her friend she’d slept in otherwise Wilf would tease her. So she said, “Oh no, why would I forget an appointment with such a good friend?” Wilf smiled happily and jumped onto the back of Molly’s motor cycle. They were off on their grand adventure. Today they were going hiking on a mountain trail a half hour journey from their home. Wilf had prepared the food and Molly supplied the drinking water. Each of them had backpacks and these were tied onto the luggage rack at the back of the motor cycle. They’d divide the food and water half each when they reached the foot of the mountain where they’d have to leave the motor cycle behind. “I suppose so,” said Stinky. But he’d looked very cross as he thought of being left out of the hike. They arrived at the shop at the foot of the mountain where tourists could buy trail maps and supplies for hiking. The trail began at the back of the shop and there was a parking lot where they could park the motor cycle. The Park Ranger lived in the back of the shop and he came to the door when he heard the motor cycle approach. “Do you need maps and supplies?” The Ranger looked hopefully at Molly and Wilf. It was not quite summer time so he’d not had very many tourists walking the trails yet. He was hoping to make some money so he could buy his wife a new dress for summer. Park Ranger smiled happily and went inside the shop to fetch the trail maps. Molly and Wilf followed him inside. 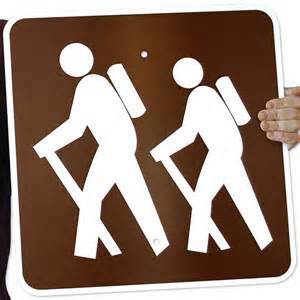 “That will be $60 for the park hiking permit and two trail maps, said the Park Ranger. Wilf looked surprised. “It only cost us $40 last time,” he said. The Ranger frowned and the two friends stepped backwards in surprise. He was so tall and big and they didn’t want to pick a fight with him. “When were you here last time,” he said? “Are you paying the same for bread and milk you did five years ago?” The Park Ranger scowled. The two friends were happy to leave the shop and after securing the motor cycle they entered the trail entrance way. They had to admit Park Ranger had done a good job with the trail. It was wide and all rubbish from falling tree limbs and leaves had been removed. The trail had also been sprinkled with gravel so there was no mud or puddles left over from winter snows to mess up their shoes. Each of them had purchased new trail shoes and didn’t want them spoiled. The trail wound its way up and around the mountain and the higher they went the cooler and fresher the air was. “Isn’t it beautiful?” Molly looked at her friend to see if he was also enjoying the scenery. Molly said, “I thought you were going to say better than Stinky!” Both of them laughed out loud. They were surprised when a bird flew in front of them and settled on a tree branch at the side of the trail. Mrs Bird looked at them crossly and trilled loudly. “Do you think you could make less noise, my babies are asleep up there in their nest?” She pointed with her wing up at a tree where five baby birds sat looking at them with cheeky grins. But when Mrs Bird turned to look up at the nest the heads disappeared as the bird babies pretended to be asleep. Wilf gave a soft laugh. “Sure Mrs Bird, we’ll try to be quiet while your babies are sleeping.” The five baby heads appeared above the nest again smiled at Molly and Wilf and then pretended to be asleep again. As the friends were hurrying up the last part of the trail to the lookout and picnic area they heard a strange rattling noise. Looking around in surprise they saw Rupert Rattlesnake sitting on a log beside the trail. They stopped and took a step backward. The friends thanked Rupert Rattlesnake and moved slowly up trail toward the lookout so they could see if a family of bears really was up there. They were not sure if Rupert Rattlesnake had been trying to trick them or not and hoped they could take a look at the picnic area from a distance before deciding to head for one of the tables. After looking carefully from a distance they decided Rupert Rattlesnake had been trying to trick them. It did not look like any bears were there at all. Molly ran to a table and began to unload her food from the backpack. “Surprise!” It was the growl of many grumpy voices. The two friends looked around them. Bears poured out of the woods growling as they came. There was no escape as they were surrounded. Rupert Rattlesnake had been telling the truth after all. Father Bear came to the table and put out his paw pointing at the food. Molly looked at Wilf hoping he would do martial arts on Father Bear, but Wilf shook his head. “Too big and too many,” he whispered. Molly’s stomach rumbled unhappily. She was so hungry. The two friends and the bear family looked around. Into the circle walked Stinky. He walked up to Father Bear. “I’m so happy to join you for a picnic lunch and it’s great to see the famous bear family here to share a picnic with us. He sat at the table and casually took his food out of his backpack. Father Bear looked at Mother Bear who was already holding her nose. His bear children were already beginning to hide back in the woods. “I don’t think I feel hungry anymore mumbled Father Bear so why don’t you have a nice picnic lunch by yourself and we’ll come back later on after you are finished and leave, and the air smells fresher. Molly and Wilf glanced at the bear family who were standing watching back at the edge of the woods. “Yes we will! !” They both shouted together. Stinky smiled knowing very well he was only welcome because he’d chased the bear family away. Molly and Wilf knew what he was thinking and felt ashamed they’d not been very friendly to Stinky in the past. They decided in future they’d show more kindness to others. No one can help how they are born and the friends decided to make him their friend in future. Stinky had been a good friend to them that day. Stinky walked over to a fallen log retrieved more food hidden under some leaves, took them to the end of the clearing and left them for the bears to eat. Then he joined them at the picnic table. “See, you don’t even have to share your food with me!” He laughed a pleasant laugh. “No I camped in the picnic area over night,” said Stinky eating his meal happily. “One of my cousins dropped me off at the trail yesterday afternoon and will be picking me up tomorrow so I’ll not have to trouble you for a ride on your motor cycle.” Stinky saw the look of relief on his new friends’ faces and chuckled to himself as he ate. “I knew you’d be at the picnic area today and watched the bear family move in from my camp site as they saw you beginning to walk up the trail at the foot of the mountain. I told Rupert Rattlesnake to give you a warning before you got up here. For some reason rattlesnakes have a bad reputation so you probably didn’t trust him.” Stinky laughed out loud. Once again Molly and Wilf felt guilty they hadn’t accepted Rupert Rattlesnake and Stinky’s friendly acts as they should have. As they waved goodbye to Stinky on leaving the picnic area at the lookout they felt grateful he’d rescued them so they could enjoy a good meal together after a long and tiring climb up the trail. They also gave Rupert Rattlesnake a friendly wave as they passed him on the way down the trail. Near the end of the hike they looked up at the nest of Mother Bird and waved to her baby birds who chirped loudly their goodbye. It had been a grand adventure and they were happy to pass through the entrance gate and see their motor cycle safe and waiting to take them home. Park Ranger also gave them a cheery wave as they climbed on the motor cycle after fastening empty back packs and headed for home. Ahh, this was a great story, Ian! Years ago I had an interest in writing children’s stories and started a few but have never finished them. They still patiently lie in the pending folder. 🙂 You have a knack. Keep sharing! I had changed this one slightly to share as the original had the main characters as my grand daughter’s toy dogs and there is a whole series on them. lol. She keeps those stories in a bound volume. What a keepsake that is for her, Ian; very special! I liked this children\s story/ Good job! Thank you Esther. Glad you are still young at heart and can appreciate these tales for the younger generation. You give the reader several healthy morals deftly packed into this children’s story, and I liked Rupert Rattlesnake. Are you going to illustrate it before you share it with your grand-children? I always think that the illustrations are the hardest part to children’s stories because most writers are not illustrators and most illustrators don’t want to illustrate other people’s stories. Perhaps you are an artist, if so it would be great to see your images along with the story, certainly your descriptions are enough to conjure up the scenes for an adult such as myself.. Thank you! My youngest daughter is the artist in the family and paints peoples pets for a fee as a sideline. She completed a beach scene in a couple of hours for us on her last visit which we now proudly hang up on our wall. She received that talent from her grandfather who used to paint, sculpture and carve as an occupation before they had to flee Europe during WWII. Actually this is an adaption from stories I completed for one of my grandchildren and the original has animals as the characters. She has made a little book for herself out of those stories unillustrated and is beginning to write stories herself at a young age so who knows whether she will be on a best seller some day. lol. I just write as a recreation. It’s good to make a backup in discs and online server such as Dropbox. Yes I did a backup on one external drive and copied everything onto another external drive before doing the factory reset but somehow the documents were not recovered but photos, music and videos were recovered. Fortunately I had a disc backup back in July 2014 in addition so at least I was able to recover some documents up to that time. I don’t trust the cloud for documents. Too many instances of supposedly safe encrypted cloud services being hacked into these days. I had a calamity this week. Lost all the stories I’d saved on computer since July 2014 so had to blog one of my children’s stories today. I had to do a factory reset and in spite of a backup disk and an additional extension hard drive on which I copy all my documents, photos, music and videos only the photos, music and videos could be found on that disk. Looks like I’ll have to keep three extension hard drives for my files in future. lol. Fortunately I was able to recover to my computer all the posts made since July 2014 through WordPress. Unfortunately I lost a lot of important documents which are not kept on the internet. So I hope you enjoy this children’s story and will try and get back to the adult stuff as soon as I can pick up the pieces again. Oh no! So you’ve lost some of your writings with no chance of recovery? That sounds terrible. Can’t your computer’s IT assistance help in recovering the pre-July 2014 documents? And this story reminds me of all the Enid Blytons I used to devour as a kid – such blissful hours they were!